There’s a process for attracting the right sponsors and corporate partners – and to ensure your relationships are robust, so that you retain them year after year. If your methods of attracting and retaining sponsors are not getting you the results you need, then join Richard Woodward at this highly practical two-day workshop that will enable you to secure long-term revenue for your organisation through sponsorships and corporate partners. Not only will you practice the key skills, learn the essential knowledge and adopt the invaluable attitudes necessary to attract and retain corporate partners, but you’ll also leave with business development techniques that you can use for many years to come. Richard Woodward is uniquely qualified to teach this workshop having worked on both sides of sponsorship and as a business development trainer. As author of the book How to Attract and Retain Sponsors and Partners, Richard shares a wealth of real-world business experience. This is a unique opportunity to delve into this specialised area with a highly skilled and qualified trainer who has trod the path before you and assisted many people like you. In a small group setting of around 16 participants, the attracting and retaining corporate partners and sponsors workshop takes you through the key stages of the sales and retention process. Understand the essential attitude, skills and knowledge of effective sponsorship seekers so that you can practice and embody these. Uncover the key questions you need to address in your sponsorship strategy so that you can confidently develop and present your strategy to your board. Richard will reveal the nine bonuses that sponsors can give you, besides dollars, that bring huge value to your organisation. 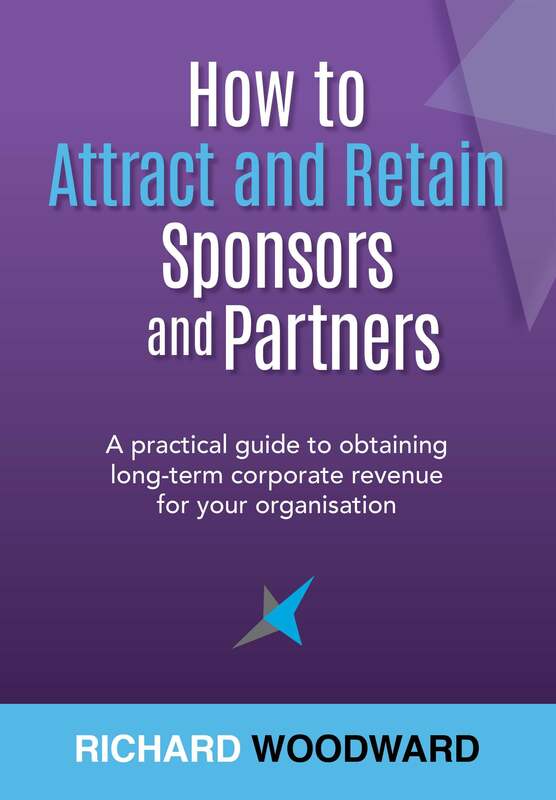 Learn the ten reasons why most organisations fail to attract and retain sponsors and corporate partners – so that you can avoid these. Knowing why companies undertake to sponsor organisations is crucial to success. We look at why sponsorship is such a powerful marketing and business development tool and what particular business objectives can be achieved through sponsorship. Examining exactly what we have to offer our potential partners will turbocharge our success rate – we run through how to successfully determine what your organisation has to offer. We look at what a proposition is (and what it’s not) and how this is critical to your success in attracting and retaining partners. You’ll discover how to craft a compelling proposition while avoiding the crucial mistake that unsuccessful seekers make in their proposition development. You’ll know exactly what essential information you must provide corporates on your audiences and communication channels, as well as the different types of sponsorship properties and how to determine which to concentrate on. Take the heartache out of valuing and pricing your sponsorship with Richard’s six-step approach for determining your sponsorships value and seven considerations on how and when to present your price. Cut down your time by honing your focus on the right prospects to approach – those who are best qualified to be attracted to your sponsorship proposition. Together, we’ll get started on your business development activity plan so that you can enjoy a constant flow of qualified sponsorship prospects to approach. Identifying high value prospects to focus your time and energy on is critical to success. We examine the right amount of research to invest to enjoy a significant uptake in your successful approaches including three questions that must be answered before approaching any prospect. Confidence is crucial, but it’s hard to stay motivated when your efforts don’t yield the desired results. We uncover the five different ways to approach a prospect, the language to use to woo and impress and exactly how to structure a phone call or emails with prospects so that they’re eager to meet you. Plus, we look at how to give a compelling summary of your partnership opportunity in just one powerful page. Make yourself and your organisation highly desirable to key players in your field with attraction marketing techniques that put you in front of prospects. The all-important first meeting can soar – or sink. Together, we cover exactly how to prepare for your first meeting with prospects to leave them wanting more. Building rapport is essential to building relationships – it powerfully increases your influence to bring about the desired effect. Learn how to systematically build rapport and see how this naturally translates into new sponsors, partnership retention and recurring revenue. Learning how to ask better questions to uncover the underlying, deeper needs of your prospects will bring about a dramatic increase in your conversion rates. Practice Richard’s widely renowned questioning and listening process as we explore the exact questions to ask that will enable you to better sell to your prospects. Discover a highly effective questioning technique that explores solutions, together with your prospect, so that you can present a proposal that really hits the mark. Your proposal needs to speak to your prospect’s needs, leading to an inevitable “yes, where do we sign?” Together, we go through the structure and presentation of a winning proposal, five visual aids to use when selling, and the difference between key facts documents, opportunity documents and proposals. The invaluable easy-to-use checklists mean that you can easily replicate effective proposals and presentations to win new partners for years to come. No sale – or rejection – should ever be a surprise after we uncover how to build commitment throughout your prospect relationship and how to read buying signals so that you can quickly recalibrate your approach and respond accordingly. We look at five techniques for provoking action and a five step approach for overcoming classic objections such as “we don’t have the budget”. When you’re better able to retain sponsors and corporate partners, you’re working smarter, not harder. We explore the mindset, tools and techniques for effectively managing and servicing sponsor relationships, including how to develop a Partnership Implementation Plan and run a Corporate Partners' Workshop to help your partners maximise their investment. This is the retention strategy Richard has used for organisations such as the Museum of Contemporary Art, Queensland Symphony Orchestra, Sydney Symphony Orchestra, Landcare Australia, Royal Botanic Gardens, Cerebral Palsy Alliance. Seeking sponsorships and corporate partners is a long sales cycle. Learn seven techniques for maintaining a positive attitude throughout your process and practical ways to boost your team’s performance. A step by step process to help you become more effective at attracting the right sponsors and corporate partners to generate long-term revenue for your organisation. A repeatable method of better retaining sponsors and corporate partners to increase their lifetime spend and for you to work smarter, not harder. Practical tools and templates to implement immediately to improve your success rate. The language to use when engaging prospects – and what to avoid. A repeatable system for crafting pitches and proposals. The clarity and confidence to inspire your own performance in securing and retaining sponsors, and insight into how to better motivate your team. Fantastic workshop that reaffirmed the work we have been doing and gave me new confidence in looking after partners once secured. Brilliant – highly relevant and learned a lot despite being experienced in business development. Great workshop content. Packed with great insights and tools. Thank you! Jeena Joyan, The Children’s Hospital Westmead. Practical application of learning was the stand out. Not just theory but take away tools valuable for any size organisation. Practical plans and tips that I can utilise immediately. All of Richard’s advice can be utilised.Truly helpful – thank you. Fantastic training workshop, really insightful. Excellent. Practical. Insightful and interesting. Brings it to life with practical sessions e.g. practising questioning. What a fantastic two days and experience. Lessons were learnt I can use in business and life. Really very helpful. Exceeded my expectations. It was very comprehensive. Great workshop, fantastic to be involved. A very engaging teacher and I liked how you continually got us to reflect on each topic and how this would impact our work processes. Great two days, very useful, all sponsorship and partnership managers should do it. Thank you, Richard, for a thought provoking and practical two days. It was such a valuable experience for me and my role at Learning Links. I feel energized and confident with the approach I’m taking with sponsorship. Your process has helped Learning Links gain valuable sponsorship over the last 12 months. Very worthwhile. I booked this course as the one I originally enrolled in was cancelled. Very pleased it worked out this way. Provided a structure that was really succinct and straightforward to engage prospects. Thank you for adapting it to different organisations that are in the room. Wonderful and rich two days that I'd recommend to others. Great workshop! So insightful and useful and has given me the confidence to source, secure and retain partners. Excellent course. Very motivating and inspiring. I feel eager and ready to go! A clear, engaging and highly practical course. Discussions and recapping after each component was great. Thank you so much. I would highly recommend this course! The right sponsorship relationship is more than the sum of its parts, not only delivering essential revenue to an organisation, but bringing countless mutually beneficial results for many years. This workshop is especially suited to corporate partnership managers, sponsorship managers, business development managers as well as development managers working in arts, culture, sports, charity, health, environment, education, association and events sectors tasked with securing corporate partners and sponsors and managing those relationships. Most importantly, it’s for people who are ready and wanting to improve their personal performance in attracting and retaining sponsors so that their organisation can achieve better results. This workshop is a fantastic opportunity to meet and network with people in similar roles in different organisations across a variety of sectors. This workshop is not relevant for people who are hitting their sponsorship targets and satisfied with their performance and results. This workshop is for motivated individuals who are willing to invest their time to implement the workshop materials so that they can experience results and measure their improvements. This workshop caters to a broad range of skill-sets and experiences from a wide variety of sectors and industries. Absolutely. Richard delivers all public workshops marketed under the Richard Woodward & Associates brand. Richard has personally delivered public workshops over the last 14 years across all major Australian capital cities and New Zealand. Workshop numbers are limited to around 16 participants to make this as interactive and valuable as possible. As numbers are deliberately kept low and due to the highly interpersonal nature of the workshop, this is NOT the kind of training where you can catch up on work. You’ll be drawn on to share your experiences, apply the learning on the spot, give feedback to other participants and reflect on what you’ve learnt. Drawing on his 30 years experience, Richard uses training and facilitation methodologies to apply a business development process to the world of sponsorship and partnership sales and retention. What materials will participants receive? All workshop participants receive a copy of Richard’s book, How to Attract and Retain Sponsors and Partners as part of the ticket price. The course is fully catered and includes morning tea, afternoon tea and lunch over the two days. In How to Attract and Retain Sponsors and Partners, Richard has solidified his experience and expertise into a highly valuable resource with plenty of detailed information, resources, templates and case studies. This book is invaluable to refer to when developing your sponsorship strategy, making sales calls, preparing for meetings and development proposals. Richard Woodward is particularly qualified to train people in attracting and retaining corporate partners and sponsors having worked on both sides of sponsorship over many years. His first experience in sponsorship was in 1987 when he managed a lawn bowls sponsorship while working as a Marketing Executive for a construction company in the UK. Over the last 14 years, Richard has developed strategies and provided training and coaching to countless sectors seeking sponsorship. He has worked with leading players in the worlds of arts, culture, sports, charities, events, music, environment, health and education as well as corporations. Richard is a frequent speaker on sponsorship and partnerships at industry conferences, presenting at Australian Sponsorship Marketing Association/Sponsorship Australasia conference on seven occasions, the Fundraising Institute of Australia (FIA) Conference five times, plus the Culture Business Conference in Sydney and Melbourne, Communicating the Museum in Paris, Audi Marketing & Corporate Communications Conference, Sponsorship News Conference, Associations Forum National Conference, International Not for Profit Convention & Exhibition (INCE), Professional Conference Organisers Association Conference, Asia Pacific Association Executives Congress (APAEC), Fundraising Institute of New Zealand (FINZ) Conference, Australian Business Events Expo (ABEE), Australian Events Symposium, Meetings & Events Australia (MEA) National Conference, Exhibitions and Events Association (EEA) Annual Conference and Events Queensland Regional Events Conference. This is not a workshop run by a consultant with limited business experience. Richard is a highly experienced, qualified trainer with the exact business experience on which he teaches. This is an invaluable opportunity to learn from someone who has trod the path before you and assisted many others like you. Richard’s dedication to sponsorships was rewarded more than 20 years ago when he was sponsorship manager at the Sydney Opera House, when he met his partner who was working on the Lexus Sydney Opera House partnership. It has been his most successful partnership relationship to date! Sydney location: The Hyde Park Forum, 271 Elizabeth Street, Sydney. Times: Day 1: 9am - 5pm; Day 2: 9am - 4pm. Investment: $1450 per person (ex GST). Book and pay before March 28, 2019, $1,350 per person (ex GST). Includes: Coffee on arrival, lunch, morning and afternoon tea, plus a copy of Richard’s book How to Attract and Retain Sponsors and Partners. Each workshop participant receives a copy of Richard's book How to Attract and Retain Sponsors and Partners. Subject to availability, a place will be reserved for you at the workshop for 14 days and a tax invoice will be sent to you via email. In the event that the workshop is over-subscribed, you’ll have the opportunity to be wait listed. Note: Richard Woodward & Associates reserves the right not to accept a registration. It may be necessary for reasons beyond the control of Richard Woodward & Associates to change the date or venue. In the unlikely event of the workshop being cancelled, a full refund will be paid. Richard's business development and corporate partnering training is outstanding. He provides one with much to consider, skills and practical know how which is life changing and makes a huge difference in how one operates. An empowering and motivating two days that has refreshed existing knowledge, provided a wealth of practical tools and guidance, and reaffirmed why I do what I do and love it! Just awesome! Richard’s sponsorship sales training helps you focus on the real needs of potential partners. No matter what level you are at, he brings great insight and will lift you to a new level. It’s made a real dollar difference to our business. The most mind blowing intense workshop ever experienced! Changed my views completely on how to attract sponsors. You need to do this workshop if you work in sponsorship. It's applicable to every industry and will set your career up for life. A brilliant insight into the process of attracting sponsors. A must for anyone who wants to attract, retain or even venture into the world of sponsorship! Fantastic training session with great insight. After completing the one day workshop 'How to Attract More Sponsors' I applied Richard's principles to my business development practice and strategy. Within six months and despite the GFC we secured hundreds of thousands of dollars and signed up two 'meaningful' corporate partners for the next three years. I highly recommend this course! This is a truly wonderful workshop, especially for people new to the industry. Full of insight, real case studies and extremely useful information to take back to your organisation. It's Friday afternoon and I want to get back to work! Worth its weight in gold. Return on investment will be realised in a matter of weeks.